The rankings (ENR Top 600 Specialty Contractors), which appeared in ENR’s Oct. 24, 2016 issue, were based on the company’s 2015 revenues. 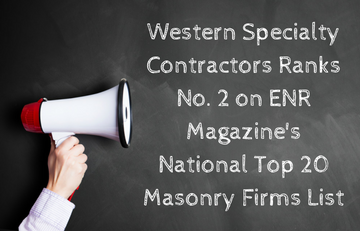 Western Specialty Contractors reported 2015 revenues from masonry projects at $71.9 million, an increase of 10 percent over the previous year. In the roofing category, Western reported a 2015 revenue of $18 million. Western has 30+ branch locations in major cities across the United States. Eads Bridge Restoration Project – Western crews restored a brick archway under the 142-year-old historic bridge crossing the Mississippi River in St. Louis, MO. Broadway Bank – Western crews restored the Texas bank building’s facade with 51,446 pounds of Himalayan quartz tile. Oak Ridge Cemetery Receiving Vault – Western crews restored the historic receiving vault in Springfield, IL that once held the body of President Abraham Lincoln. Freedom Place Apartments – Western crews restored the facade of a dilapidated building in St. Louis, MO for use as apartments for homeless veterans. Norden Hall – Western crews restored the facade of a landmark row house turned restaurant in Des Moines, IO. Founded over 100 years ago, Western Specialty Contractors has continued to refine and perfect its innovative techniques in masonry restoration, having worked on some of country’s most iconic landmarks throughout its history including the Field Museum of Natural History in Chicago, IL; The Citadel in Charleston, SC; Martin Luther King, Jr. Federal Building in Atlanta, GA; Mazza Castle in Pacifica, CA; Shrine of Saint Joseph in St. Louis, MO and One Wall Street Tower in New York, NY, among many others.